Gale Eugene Sayers, nicknamed the "Kansas Comet," was born on May 30, 1943 in Wichita, Kansas. Gale was born to Roger and Bernice Sayers and is the second of three sons. Gale’s father, Roger Sayers, worked as a mechanic for Goodyear until 1950 when the Sayers family moved to Speed, Kansas. After a year of living in Speed, they moved to Omaha, Nebraska where Gale spent the rest of his childhood. Sayers started playing football when he was eight years old with a local midget football league. Sayers attended Omaha Central High School and played middle linebacker on the varsity squad where he was an all-around athlete in high school, excelling in football and track and field. During his senior year, he signed 17 letters of intent for football, including Iowa State, Northwestern, and Notre Dame. However, Sayers chose to play halfback and attend the University of Kansas in Lawrence, Kansas. At the University of Kansas, Sayers excelled on the football field while wearing #48, and earning the nickname the "Kansas Comet." After his freshman year, he married his high school sweetheart, Linda Lou McNeil, on June 10, 1962. During his sophomore year, he broke into the National College Athletic Association (NCAA) record books by scoring a 99-yard touchdown run against the University of Nebraska. During his junior season, Sayers won the Big 8 conference "Back of the Year" award. In his senior season, Sayers had amassed 2,675 total yards; he was named on the All-American team his junior and senior seasons. In 1965, Sayers was drafted in the first round of both the National Football League (NFL) and the American Football League (AFL). Sayers chose to play for the NFL’s Chicago Bears, signing a 4-year, $100,000 contract. During his rookie season, wearing #40, Sayers had an immediate impact for the Chicago Bears, rushing for 867 yards and scoring 22 touchdowns. Sayers scored a record 6 touchdowns in a single game on December 12, 1965. Sayers was named NFL Rookie of the Year and invited to the Pro Bowl. 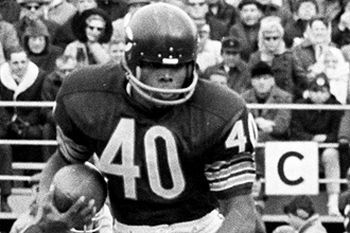 During his second year with the Chicago Bears (1966), Sayers led the league in rushing with 1,231 yards and amassed 2,440 all-purpose yards. In 1967, Sayers shared time with other running backs, finishing the season with 880 rushing yards. In 1968, Sayers’ season ended early due to a knee injury, finishing the season with 856 rushing yards after only 9 games. After surgery and recovery, he came back to lead the league in rushing in 1969 with 1,032 yards. However, 1969 would be his final NFL season; Sayers suffering another knee injury in 1970. Sayers retired in 1971, playing 6 seasons with the Chicago Bears (1965-1971). Sayers had many honors in the NFL, including Rookie of the Year (1965), 4 times Pro Bowl Selection (1965-1967, 1969), 3 times Pro Bowl MVP (1966-1967, 1969), and 5 times All-Pro Bowl Selection (1965-1969). Sayers finished his NFL career with 6,213 all-purpose yards and 48 touchdowns while only playing in 68 games. At 34 he was inducted into the Pro Football Hall of Fame in 1977, the youngest football player so honored. Sayers was also inducted into the College Football Hall of Fame. His #40 jersey was retired by the Chicago Bears. In 2009 Sayers returned to the University of Kansas where he became the Athletic Department’s director of fundraising for special projects.